Mélomanie devoted the opening concert of the 2016-17 season — its 23rd — to the appreciation of the viola da gamba and its music. 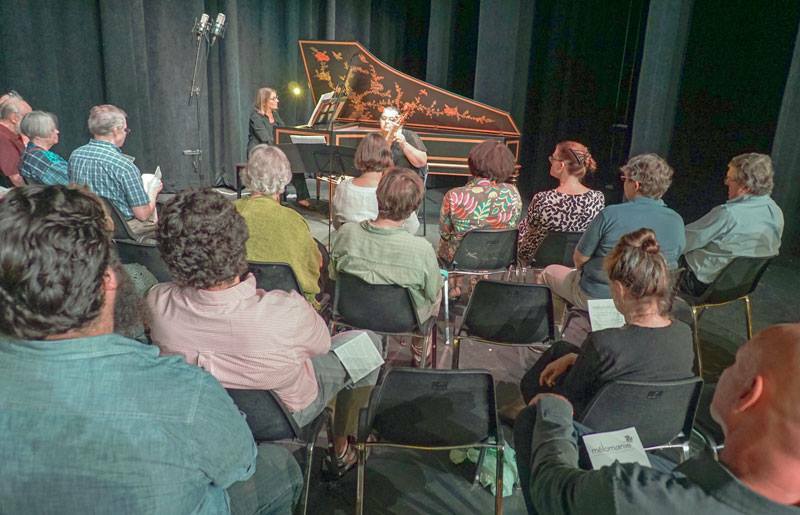 The concert featured Mélomanie Executive Director and Co-Artistic Director Tracy Richardson on harpsichord and the ensemble’s virtuoso gambist Donna Fournier in performance at the Wilmington Friends School in Alapocas. The concert was titled “Up Close and Personal,” and that’s exactly what it was, with the audience seated on stage with the performers. First things first: As Fournier pointed out, a viola da gamba is not a fretted cello, even though it may resemble one. A cello has four strings while a viol usually has six, like a guitar, or seven. But unlike a guitar, the viol’s frets are not permanently set, but rather made of gut and tied on, like a lute, and thus movable. The viol is also tuned differently from the cello. Viols are tuned in fourths with a third between the third and fourth strings, just like a lute. Cellos are tuned in fifths. Viols are bowed like cellos but the bow is held underhand rather than overhand. Another difference: The viol is much quieter than the cello. In fact, they were too quiet to be effective in large orchestras or big concert halls and fell out of favor after the 18th Century. The program featured a sampling of works by the major gambist/composers, including Marin Marais, Carl Friedrich Abel, Tobias Hume, Gottfried Finger, Georg Philipp Telemann and Johannes Schenck. Contemporaries continuing the tradition included Mark Hagerty and Mark Rimple — the latter a former gamba student of Fournier and now a professor of Music Theory and Composition at West Chester University. The program also featured a nice balance between solo works — including a recently discovered work by Telemann — and those with basso continuo. And who better to deliver these works than Fournier, undoubtedly the most accomplished gambist in the region and quite possibly beyond. Fournier’s tone is sumptuous; her intonation perfect. The wistful notes and rich depth of the bow across the gamba were complemented by the distinctly sharper sounds of Richardson’s harpsichord. And just when you thought Fournier couldn’t play any faster, louder or softer — she did! Particularly arresting was Fournier’s and Richardson’s execution of the expressive lines of Marin Marais’ Suite in A Major. The deliberate Prelude paved the way for the stately Allemande and the determined Chaconne. Their rendering of Johannes Schenck’s Sonata No. 1 in D Minor was also expertly done, with the composer’s highly disparate stylistic palette played up to maximum effect. An equally vigorous delivery was given to Mark Hagerty’s Civilisation (2001), which imagined how Baroque might have been played in the 21st Century had not it taken a “wrong turn” in the 18th Century. Fourier showed off her improvisatory skills in Abel’s Prelude in D Minor, and her technical virtuosity in Finger’s Divisions on a Ground and Mark Rimple’s contemporary Dementanz from Sonata Circumdederunt Me. Her performance of A Question and an Answer by English eccentric Captain Tobias Hume was clever and witty. Fournier also treated the audience to a performance of a recently discovered Fantasia by Telemann, applying herself to the wealth of musical ideas contained in the piece.